Is everyone listening to Daniel Johnston without me? 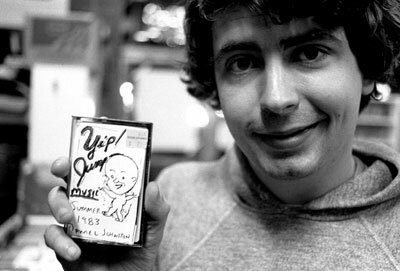 Last night I watched The Devil and Daniel Johnston, a 2006 documentary on this extraordinary singer/songwriter. It taught me a lot about songs I already love, because so many artists have covered Johnston and so many others want to sing like him. Johnston, who is still making music, writes musically sparse narrative ditties about silly things and love. He reminds me a lot of the Beach Boys, Mountain Goats, Bright Eyes, Casiotone for the Painfully Alone, and early Of Montreal. I know Wilco and Tom Waits and Yo La Tengo have recovered covers and tributes. I recommend "I Had Lost My Mind," as an introduction, unless of course you are already listening to him and never clued me in. When I think of the artists who have most formed my ear, and the timing of when I discovered each of them, I'm able to piece together pleasant narratives and an acceptable interval between discoveries. I have few ... regrets -- was not often blindsided. Then I watched this Daniel Johnston doc and was sort of angry and definitely filled with a pleasant wonderment about everything yet to be learned. I ordered two Johnston tapes, as that was his preferred dubbing medium, and one compilation CD. I've been using YouTube playlists on 'play all' mode in the meantime. And I'm thinking a lot about the old 'toy' organ that a friend gave me and which I have upstairs, because I'm pretty sure it's the same kind Johnston used. Johnston's music has so consumed me that I spent the day singing about everything: my abandoned baked potato, my moat and my boat, and my grass (the tallest in town). "All that is made is made to decay"
I discovered him in Charleston last year after Lauren Chester strongly recommended the documentary for me. He's sweet. I agree with your points about learning. Also, I've been hoping someone would notice the 'play all' function in YouTube as well. It's great. The other day I listened to "It's Blitz!" in the office using that tool. I know Ryan had been into him since at least sophomore year. I seem to remember him playing and maybe even burning us a DJ covers album in Koon. But that's all I remember about him, I think he sort of faded off the radar for me. You know, the one thing I wanted when I lived at home was to not have to cut the grass (or mow the lawn, as they call it here, and in WI, and everywhere else that's not Louisville), but now that I live in an apartment... I wish I had grass. But when I have a house, I'll get the good kind. The kind that doesn't grow... like my grandpa had. His hair was that way too. Soon we'll be storing stuff in the dense grass.